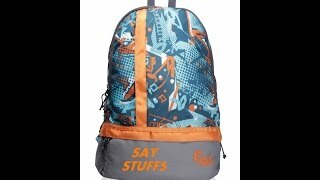 The lowest price of F Gear Burner P10 20 L Small Backpack(Multicolor) was obtained on April 19, 2019 8:38 pm. Guys the bag looks pretty darn on the image and it looks big but believe me it’s pretty small and not a great choice if you’re a person who carry’s a lot of stuff. But it’s good in it’s own way and I would say the blue is better than the black version, but I should say the color is not that bright and not very attracting looking, Still It looks okay, And the best part about is the inner side of this bag, ITS BRIGHT ORANGE, really cool, and the most attracting thing about this bag. This turned out to be a bit smaller in length than expected. It’s more of a college bag n not a backpack. Overall product is good. I’ve been using it for months now. It’s a great product. It was the same seen in the picture.. Good product in quality…. Weightless… Cost is quite low..
Good quality bag.Best suited for school kids.Very durable. Quality of the product is average .uper material is good but inside material is cheap.. medium size bag , good for college.you can’t put heavyweight books as it can’t handle that for long..a laptop compartment is there you cancarry 15.6 inch laptop.overall it’s good for normal use.its looks nice from front.